Breakthrough Listen, the 10-year, $100-million astronomical search for intelligent life beyond Earth launched in 2015 by Internet entrepreneur Yuri Milner and Stephen Hawking today announced its first observations using CSIRO’s Parkes radio telescope. Parkes has joined two US telescopes, the Green Bank Telescope in West Virginia and the Automated Planet Finder at Lick Observatory in California, in their ongoing surveys to determine whether civilisations exist elsewhere and have developed technologies similar to our own. Yuri Milner, founder of the Breakthrough Initiatives which include Breakthrough Listen, said the addition of Parkes was an important milestone. "These major instruments are the ears of planet Earth, and now they are listening for signs of other civilisations,” Mr Milner said. After 14 days of commissioning and test observations, ‘first light’ for Breakthrough Listen at Parkes was achieved this morning (8 November (local time)) with an observation of the newly-discovered Earth-size planet orbiting the nearest star to our Sun, Proxima Centauri. A red dwarf star 4.3 light years from Earth, Proxima Centauri is known to have a planet (‘Proxima b’) orbiting within its habitable zone, the region where water could exist in liquid form on the planet’s surface. Such ‘exo-Earths’ are among the primary targets for Breakthrough Listen. Dr Andrew Siemion, Director of Berkeley SETI Research Center and leader of the Breakthrough Listen science program, said the chances of any particular planet hosting intelligent life-forms are probably minuscule. “But once we knew there was a planet right next door, we had to ask the question, and it was a fitting first observation for Parkes," Dr Siemion said. "To find a civilisation just 4.2 light years away would change everything." CSIRO’s Parkes radio telescope is perfectly positioned to observe parts of the sky that can’t be seen from the northern hemisphere, including the centre of our own Milky Way galaxy, large swaths of the Galactic plane, and numerous other galaxies in the nearby Universe. Dr Douglas Bock, Director of CSIRO Astronomy and Space Science, said the Parkes telescope was one of the most highly cited radio telescopes in the world. “The Parkes radio telescope has a long list of achievements to its credit, including the discovery of the first ‘fast radio burst',” Dr Bock said. "Its unique view of the southern hemisphere sky and cutting-edge instrumentation means it now also has a great opportunity to contribute to the search for extra-terrestrial life." Swinburne University of Technology is working closely with University of California, Berkeley, and CSIRO to design and implement a signal-processing and data-storage system for the project that will make the Breakthrough Listen data available to the science community. Professor Matthew Bailes, ARC Laureate Fellow at the Centre for Astrophysics and Supercomputing at Swinburne University of Technology, and the Breakthrough Listen project’s Australian science coordinator, said Breakthrough Listen would do more than just hunt for ET. 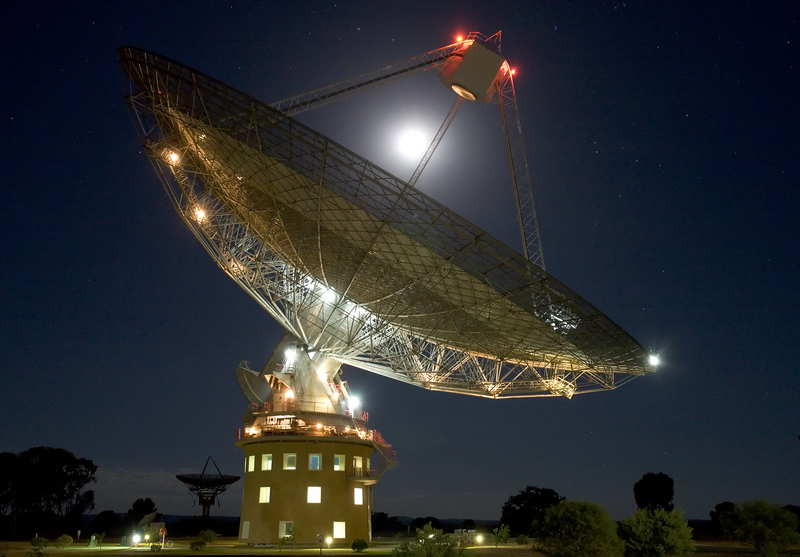 “The detection system on Parkes will be simultaneously searching for naturally occurring phenomena such as pulsars and fast radio bursts, which are a large part of Parkes’ present work,” Dr Bailes said. "The Australian science community welcomes the opportunity to share the Breakthrough Listen data for other ongoing research projects." Breakthrough Listen will use 25 per cent of the science time available on the Parkes radio telescope over the next five years. The Breakthrough Listen science program is directly aligned with CSIRO’s strategy to operate world-class national facilities for the use of scientists, to ensure that those facilities are adequately and sustainably funded, and to facilitate the delivery of world-leading science outcomes and impact.